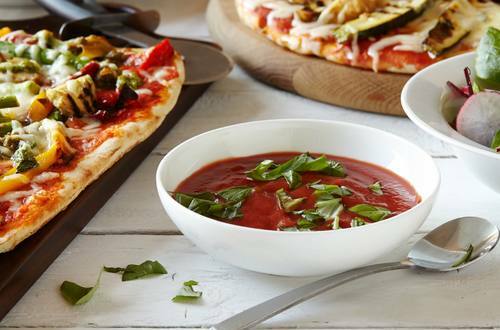 The perfect pizza sauce recipe with garlic, basil, tomtatoes and a touch of rich, creamy Hellmann's® or Best Foods® Real Mayonnaise. 1 Heat olive oil in large saucepan over medium heat and cook garlic, stirring frequently, until just golden, about 3 minutes. Stir in remaining ingredients. Bring to a boil over high heat. Reduce heat to low and simmer covered, stirring occasionally, until sauce is cooked, about 30 minutes. 2 Blend sauce with immersion blender or in blender until desired consistency. Makes enough sauce for 2 to 3 pizzas.